I’m going to try very hard to restrain my anger in this post, but I’m making no promises. In a whirlwind of activism recently, thousands took to the streets for the first time to express their anger at the Coalition government voting in new legislation which raises the cap on tuition fees. It was an incredible throwback to the days of anguish felt by those under Thatcher, and the anguish is set to continue via a series of new grassroots networks. These new organisations, which include anti tax avoidance group UK Uncut and various “occupation” movements" (who are very active on Twitter), embody the prevailing sentiment of outrage felt by vast swathes of the population here. The cuts are deemed necessary by a Coalition government looking to roll back the state, but they are not by this new generation. Even organisations like the National Union of Students (NUS) have been criticised of twiddling their thumbs in the face of this crisis. Their chief, Aaron Porter, has been accused of weak leadership, even pandering to the elites. As such, a vote of no confidence in his position is imminent. After all, merely appearing on all of the BBC’s coverage isn’t enough, is it Aaron? That is where I’ll end with the neutral observation. I am gravely pissed off, much like these students and soon to be students. Having officially graduated in September this year despite completing my course at UCL last year, I have been thinking about what someone needs, or what someone has to do, to be considered “excellent". What does it even mean now? This is, after all, the task which schools and universities must put at the centre of their mission and their duty to society. Notice, I have deemed it a duty of schools and universities to inspire and nurture excellence. In other words; education is a right, not a privilege, and this is because the people who emerge from them will be working in society, creating new ideas, and ensuring the progression of humanities on issues such as democratisation, economic justice and technological innovation. Thus, having educated people benefits society, innovative business and, something which is seriously overlooked, the critical thinking of a nation who is at the very centre of worldwide crises and foreign policy conundrums. Phillip Green wants to reap the benefits of publically educated people in his business, but not pay towards the very system producing them. Its a simple economic principle: maximise benefits and minimise costs. When legislation can include language allowing “tax avoidance” but not “tax evasion”, you will have politicians clambering to appease the corporatists who seek these loopholes. Leadership is impaired if, like you have now, our Bullingdon club of leaders simply do not represent the people. Schools and universities are subject to government legislation, so the whole mechanism is meant to be accountable to their electorate (cue Lib Dem confusion). What we are seeing today is no accountability. The government want to privatise our education by making up to 80% cuts to the teaching budgets of universities. This will change everything. 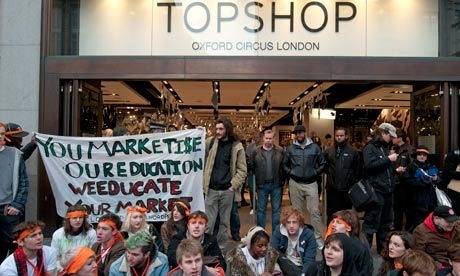 By raising the cap to £9,000 a year, this will mean a total debt of £40-50,000 for a university education will not be uncommon if you factor in loan costs and accommodation – emphasising the belief held by the government that education is indeed a privilege. This is papered over by invoking the “nothing up front” feature the government are rather smug about. Becoming our creditors brings them joy – how fitting. Only someone bred for power can feel this sense of entitlement from us supposed underlings. 1. Maintain the value of university education by making it more exclusive again. 2. Deter some from even attending because of the fees and the dismal state of the job market which lies before them. It is, and I must emphasise this, no way meant to improve higher education. It is simply privatising it and loosening the grip the state has on these institutions so “they can get on with it” a la the invisible hand. It is an age old ideology, and that must be made clear through wave upon wave of bare-faced lies made by our government. Thing is Mr Cameron, most of us don’t believe these lies of yours and your cronies. These two issues of tax evasion and tuition fees are intimately linked, if not by subject matter, but public sentiment. The outcry has been fierce because of a harmonious message: the cuts are not necessary, university education is a public good which requires public money, and tax cheats, whatever their stripe, should pay their dues towards a system they benefit from. The feeling at the centre of all of this is a desire for justice and social responsibility. In the speech opening my graduation ceremony, the vice-provost of the university declared, “excellence is not only measured in one’s achievements, but it must also exist in one’s attitude”. What surfaces within those protesting the rise of tuition fee and those who are outside the stores of tax evaders is this excellence of attitude. A condition of victory for corporatists and the political elites who serve them is consumer apathy. We are currently being groomed to become consumers first and citizens second. The “Big Society” is positive spin for government cuts – we don’t need Wikileaks for that. By demonstrating our anger, we rob them of their greatest asset – our indifference. Our indifference dissolves them of their responsibility to us as our elected representatives. We cannot be indifferent when they shape and mould our world as they please, to benefit them and their circle of rich buddies. By privatising more and more things, big business has access to new markets ripe for exploitation and the government has an easier job. Our excellence is precisely measured by our awareness and our critical examination of events. Critical thinking is the bane of all elites, who prefer to keep it a dynastic privilege, if that. This is done by ensuring we keep one of our eyes fixed on an end financial incentive, whereas they have the freedom to entertain whatever means with their full attention. To put it in the context of a student’s perspective over the Atlantic (who are basically living in a U.K. in the year 2035), I have a video to share. Here, Erica Goldson, a girl from a school in the U.S. gives a meaningful speech on her graduation. There, the free market disease has long had a firm grip on schools and universities and largely stifles critical thinking and innovation. We all have a duty to future generations, but lets not forget this current one, our one, who is charged with affecting change for the better. Talking vaguely about what embryos deserve is not enough – we must act in solidarity to remedy the injustices in our society. These politicians must remember – they serve us – and we will light bigger fires until they accept that. So, what does the future hold? Or better yet, what should the future hold? After all, it is our task to collectively shape it – not sit in the backseat. The royal family is not the only group with a stagnant gene pool; the media, the government, and big businesses are all inbred and self-preservationist. This will be their downfall as survival is achieved through diversity. That is a natural law – not a policy.